Fire & Light makes these wonderful hand-poured glass holders in a range of colors. The glass is made from over 90% post consumer recycled glass. (except lavender and citrus). They look great with our candles. 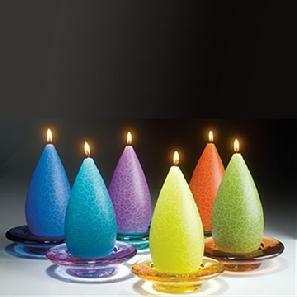 Fire & Light recycled glass holders with tall FF#9 candles. 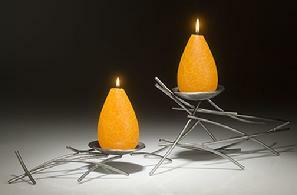 Al Stephens hand forges these great iron candle holders that are a perfect holder for Barrick Candes. I live above the Pequea Creek in southern Lancaster County. Al used to live in the Pequea Watershed, he relocated to Alabama, kept the name. 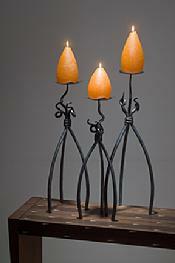 Pequea Forge Iron Candle Holders with Dark Citrus Candles. Ceramic holder with little candle. Available in a variety of patterns and glazes. They work great with our candles. Mark creates candle holders and other sculptural items form kiln formed glass incorporating wonderful metallic and earthy colors. This web site is only accessible to qualified retail accounts. 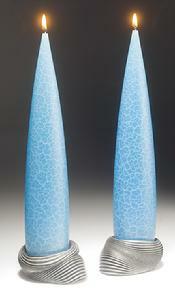 Mark Hines Glass Candle Holders. Julie & Ken Girardini create beautiful objects for the home from cold finished steel. These candle holders look great with our candles. 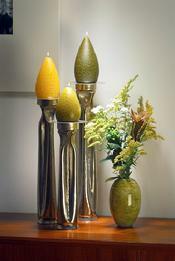 Tom makes the wonderful metal hollow ware candle holders that are designed just for Barrick Candles. I love to use them throughout my home. Tom Markusan Forged Copper Candle Holders. Click on the picture to see some more of his work. 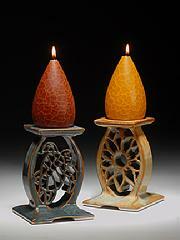 Art Mathewson makes these beautiful colored copper and cherry wood candle holders. 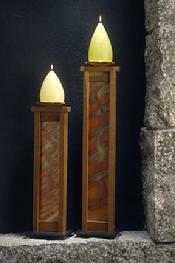 Morningstar Metalworks colored copper and cherry wood candle holders. "Twisted Torso" Aggressively forged and acid etched mild steel candle holders. Lee designed these candle holders for the 14" FF#1 Candle. Right now they are a one of a kind. He makes a variety of smaller holders that he sells on Etsy.